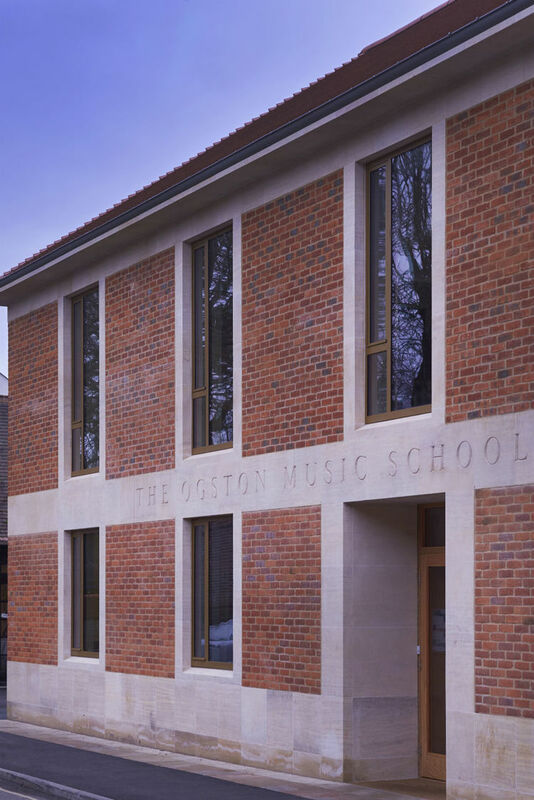 Last night I was privileged to be invited to attend the opening of the Ogston Music School at St Edward's School, Oxford. 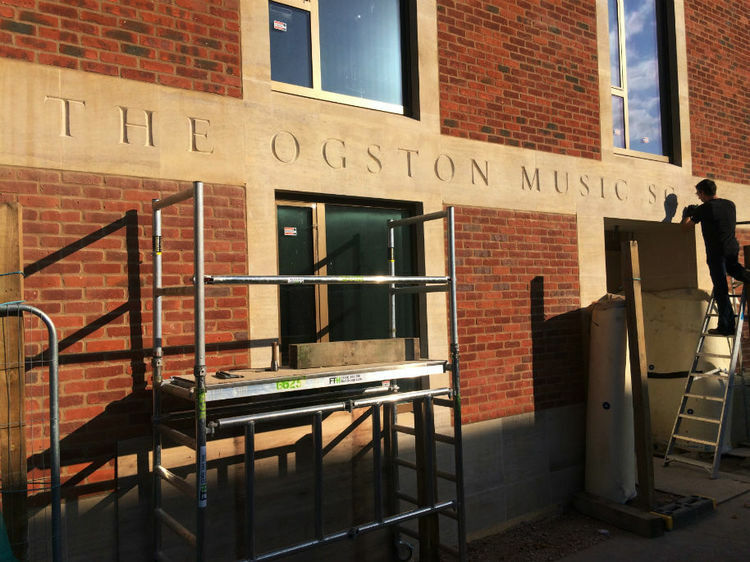 It is a beautiful new building and I was asked to carve the name of the Music School above the main entrance straight into the Clipsham Limestone, a durable material with a lovely honey colour. 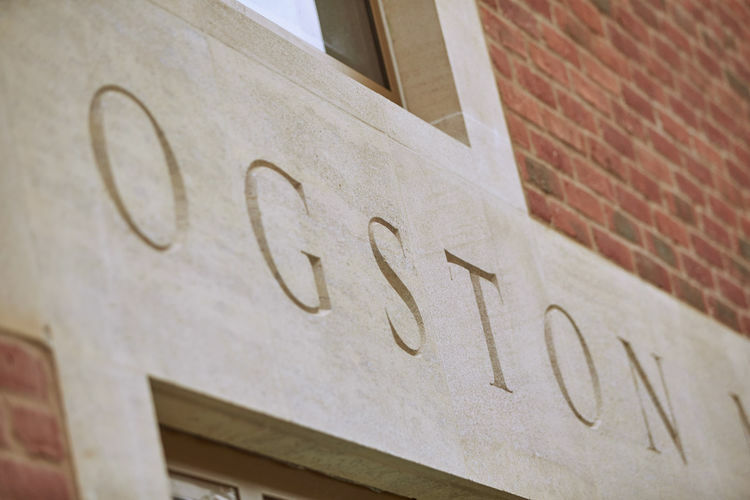 When I first met with the architect we discussed the letterform we would use and decided to use a traditional letterform and I suggest Goudy Old Style, which lends itself well to carving in stone and is clear and easy to read. In setting out the inscription I took into account the angle from which most people would be reading the inscription, which is likely to be slightly from the side rather straight on because the street is so narrow. I, therefore, allowed plenty of space between each letter as when viewed from the side they will appear closer. Each letter is about 10 inches high. Although based on the Goudy typeface I was not constrained by it, and I widened the M's and N's slightly as I feel they tend to be a bit narrow. 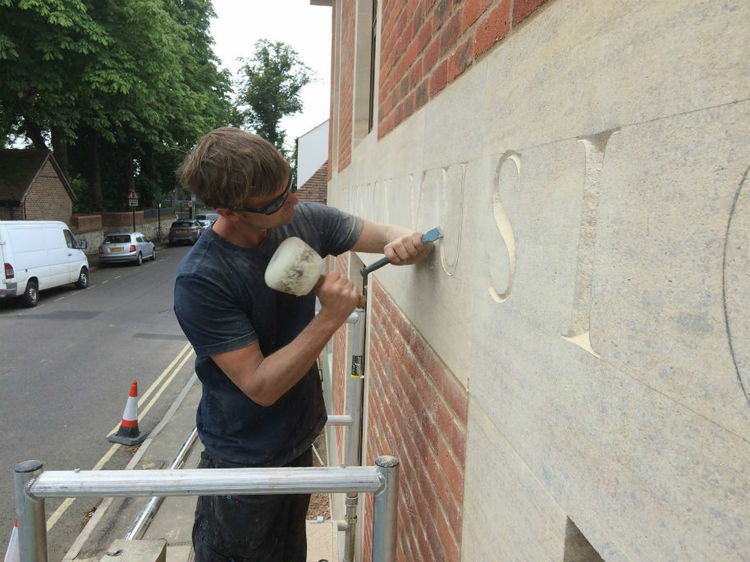 We carved the letters using no more than a mallet and chisel on scaffolding, having first drawn the inscription out freehand. I never use stencils or rulers to measure the spacing between the letters, preferring to use my eye to move letters by fractions of an inch if necessary. We were also asked to make an opening inscription for the entrance hall, and I discussed with the architect the idea of a plaque to be mounted on the wall but came to the conclusion that it might detract from the smooth lines and elegance of the building. We, therefore, opted to carve the inscription directly into the existing stone wall of the entrance which worked very well indeed. It is subtle and graceful. 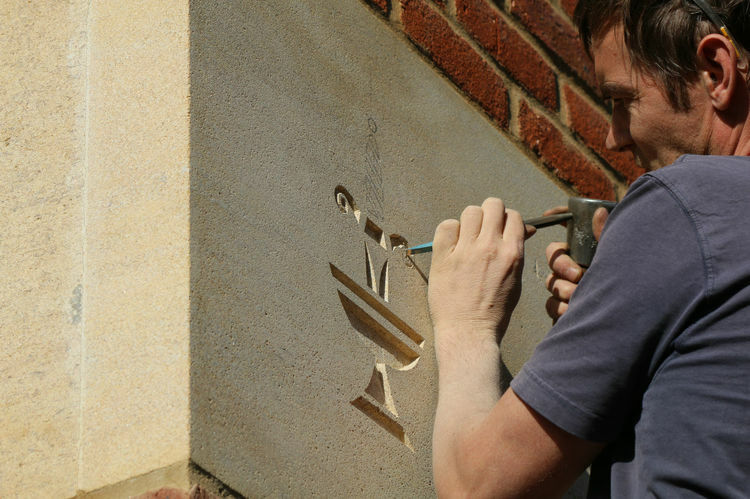 Finally, I was asked to carve the School's crest of a cup and dagger either side of the main inscription.